Yesterday I took part in a mega Handel’s Messiah sing-along, prepared and performed in just one day. 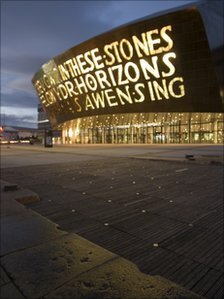 Conducted by David Lawrence, 1,000 voices, most certainly nearing if not well past sixty, gathered from different parts of the UK to raise the roof of Cardiff’s Millennium Centre. It’s the first time I have ever taken part in this kind of choral singing, and I am now hooked. But not just for the music. I went with two fellow altos from Cirencester’s Choral Society, which meets and sings every Tuesday evening. We had a very jolly drive over the Severn Bridge karaoke-ing along to ‘Forwuntous a child is born,’ (number 12 in the score). Our choirmaster, and I would imagine every choirmaster/mistress in the known universe and for all time, goes apoplectic about this. It should be a clear crisp, ‘For-unto-us-a-child-is-born’, but you try singing it. We arrived in good time, grabbed some coffee, and tucked into our picnic lunch. We were then ushered into the magnificent auditorium to find our seats and settle. This threw some people into turmoil. Groups of three or four altos pushed past us to sit, nestle, and then decide, no. Not these seats. They would then push past us again to find more suitable nests one row in front, or two rows behind, or perhaps in the aisle to the left. I confess, I was a getting a little irritated. Finally, a woman quietly sat down next to me, and opened her music score. I knew she was going to stay. The rehearsal began, and I was immediately swept away by Handel’s extraordinary musical achievement, written, I might add, in just 24 days. How did he do that? Apart from passing initial pleasantries with my neighbour, it wasn’t until the interval during the actual performance that I asked her if she’d sung the Messiah before. No, she said, she had not. I guessed she must be an accomplished musician to be able to sight-read what to my untrained eyes looks like a complicated score. Yes, she replied, she was indeed a musician, but for personal reasons had not been performing recently. She then poured out her story. I’m not going to go into details, but it involves a betrayal, which, after thirty-five years of marriage, had left her utterly shattered. She had come to sing the Messiah to help herself heal her broken heart. I was very aware of her as we sang the magnificent Hallelujah chorus. And, a thought struck me about the healing potency of music, especially when singing in a large group. All at the same time, you are an individual as well as part of the collective. Your voice counts. You matter. But you can also sink into the sounds of those around you, and be carried along by the choir’s force and energy. My neighbour was in tears as the last ‘Hallelujah’ rang out. I wanted to put out my hand to her, but I sensed she would find it intrusive, and needed the space to experience the might of this music right to the bottom of her soul. At the end of the performance she profusely apologised for what she had said. Although understandable – after all, I was a complete stranger – I was sad she felt compelled to do this. It made me think of the strangers I have met for fleeting moments during my life, all of whom appeared at the perfect moment to provide something that I needed, such as an insight, or piece of advice, or a much needed listening ear. It reminded me that while we as individuals are struggling to make sense of what life throws at us, each one of us is also part of a vast human enclave engaged on this challenging journey from birth to death. It also made me wonder at the magic of life. Four people had sat in this woman’s seat before changing their minds, and leaving it free for her. Perhaps they did not need a stranger to talk to. So, it gave me a lesson in curbing my impatience. You never know who you are sitting next to, or why you have been drawn together. This entry was posted in All posts and tagged Cardiff Millennium Centre, Cirencester Choral Society, Conductor David Lawrence, Hallelujah chorus, Handel's Messiah. Bookmark the permalink.